Walks on the Wildside No 4 Kensworth at Kensworth Walking RouteThis is one of a series of short walks throughout the countryside in South Bedfordshire. 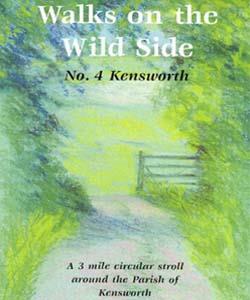 It is a circular walk exploring the village of Kensworth, its history and the local environment. This is one of a series of short walks throughout the countryside in South Bedfordshire. It is a circular walk exploring the village of Kensworth, its history and the local environment. How to get there by car/parking: From the centre of Dunstable take the B489 then left at the roundabout - B4541. Another left turn -B4540 to Kensworth. Limited on road parking is available in the village. Please show consideration to residents. Alternatively park at Dunstable Downs but this will add approx 1 mile to your walk.